If you’ve ever played host for the holidays, you know that while it is always fun to bring family and friends together, it can also come with its own headaches. Getting the house decorated and ready, preparing a menu and cooking the food, and the looming cleanup chores can be enough to overwhelm even the most experienced host. 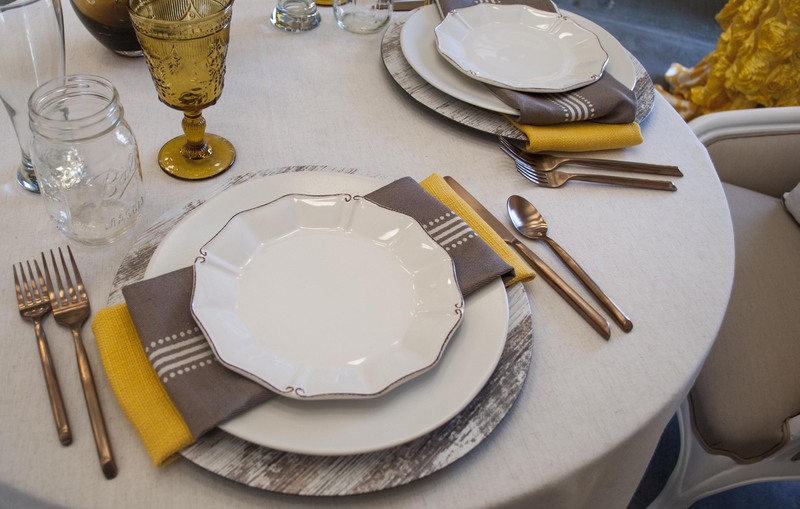 Luckily we can help with these 5 Tips to Host the Holidays without the Headache! If you know you are hosting a holiday celebration at your house, you’ll want it to look as festive as possible! But holiday decorating can be a big task that takes a lot of time. If possible, start early so you don’t feel rushed. But if time is not on your side and you need to get the house ready within a tight schedule, just focus on a few key items to set the mood. 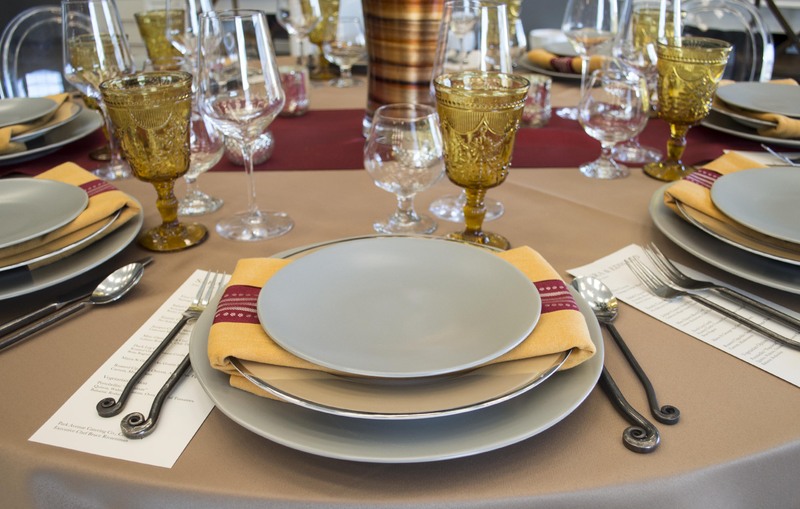 If you’re hosting Thanksgiving dinner, focus on your table settings and decor. If it’s Christmas, just make sure to get the tree up and hang some stockings. Once a few main elements are in place, you can relax and only add more décor if you have the time. Trying to do it all is a good way to get yourself overwhelmed. Be sure to delegate what you can and don’t try to take on every responsibility by yourself. Take your most daunting task and ask someone for help. From decorating, to cooking, or just putting the plan in place, your friends and family will likely be eager to lend a helping hand wherever they can. 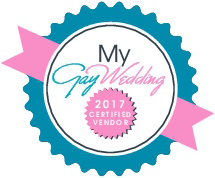 Don’t overlook the possibility of hiring professionals for certain aspects of the party planning process. You may not want to splurge on an event planner for a family holiday, but you can certainly hire out for stages of the process. Hire someone to come deep-clean your house, contract a caterer for dinner, and have rental linens and tableware delivered to your house to cut down on setup as well as cleanup. 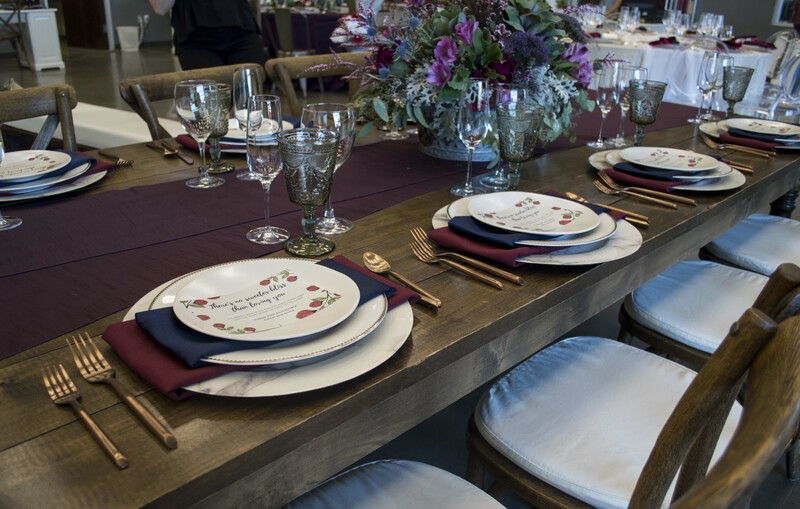 Even if you love planning and hosting events, cleaning up can be one of the biggest hassles. Think ahead during the planning process to save yourself some of the post-party stress. 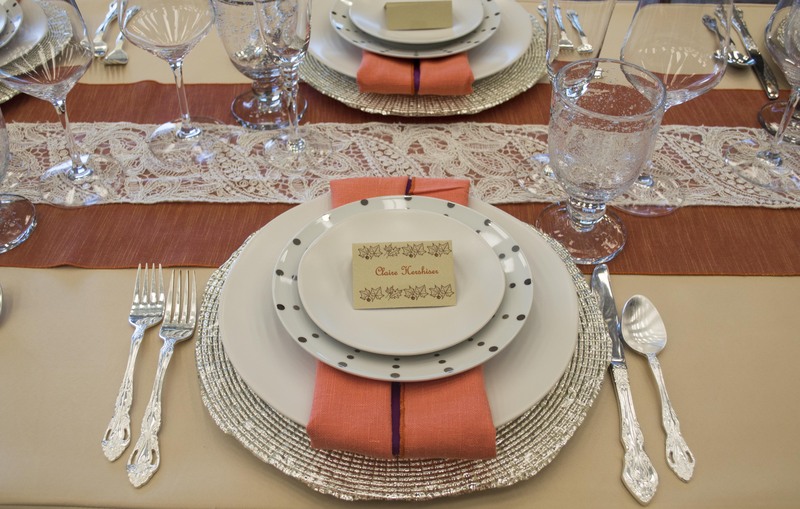 If you are hosting a meal, plan early and rent your dishware, flatware, and glassware. You can coordinate a perfectly festive look and you get to skip doing the dishes entirely. 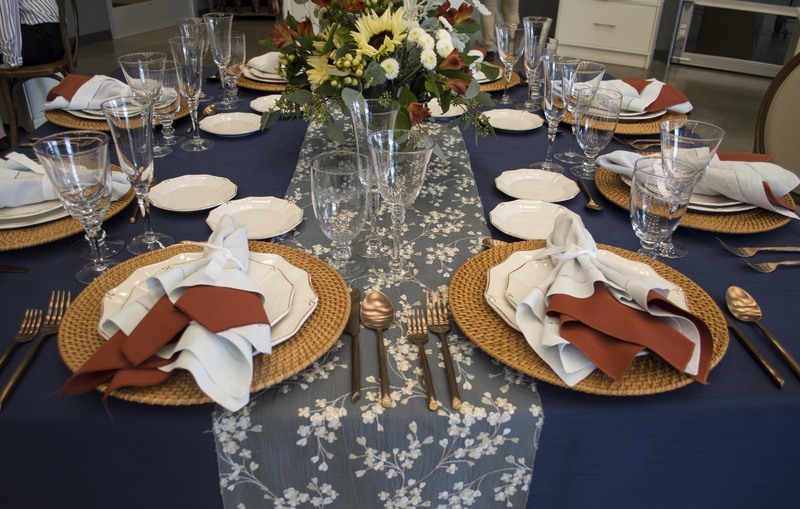 Table linens and napkins can also be rented in small quantities, so you can take laundry off your to-do list. Opening presents can also cause a big mess, so put trash bins or bags out around the room before everyone starts ripping into the wrapping. You can also put a receptacle nearby for reusable gift bags. Keep the kids busy and reduce your stress by having a space specially prepared for your younger guests. Load up a child-sized table with games and activities to entertain them until dinnertime. 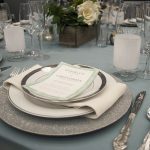 Then when it’s time to serve up the food, help them clear the table, throw on a table linen and drop some place settings. They will enjoy having their own space for play and for mealtime and cleanup will be much simpler without those surprise messes throughout the whole house. 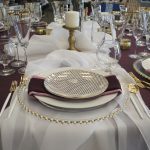 Products pictured: Walnut Stained Farm Style Table, Cross Back Chair, Lacquered Faux Marble Charger, Victoria Dinner Plate, Lucca Ivory Salad Plate, Presley Flatware, Caprice Fig Runner, Burgundy Polyester Napkin, Navy Polyester Napkin, Smoke Dixie Goblet, Sonoma Red Wine Glass, Sonoma Champagne Glass, Khaki Polyester Tabledrape, Caprice Tangerine Runner, Lace Cream Sash, Burst Silver Charger, Lucca Ivory Dinner Plate, Kate Salad Plate, Lucca Ivory Bread and Butter Plate, Royce Silver Flatware, Bubble Water Goblet Clear, Ledge Wine Glass, Belle Champagne Glass, Satin Fig Napkin, Linen Persimmon Napkin, Caprice Navy Tabledrape, Olivia Blue Runner, Round Light Wicker Charger, Charleston Dinner Plate, Charleston Salad Plate, Linen Robin’s Egg Napkin, Brick Polyester Napkin, Emma Water Goblet, Belle Wine Glass, Charleston Bread and Butter Plate, Lucca Grey Chop Plate, Cognac Luster Dinner Plate, Lucca Grey Salad Plate, Latte Polyester Tabledrape, Contempo Scarlet Napkin, Cabo Marigold Napkin, Fiddle Flatware, Amber Dixie Goblet, Brandy Snifter 6 oz, Cardinal Polyester Runner, Harvest Oatmeal Tabledrape, Lacquered Distressed Wood Charger, Contempo Cappuccino Napkin, Mason Jar, Beer Pilsner Glass.